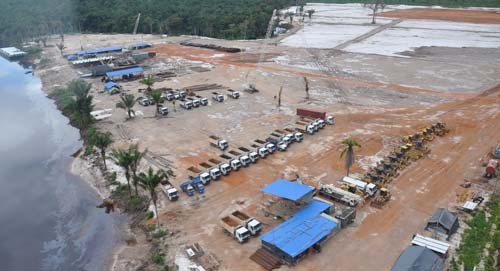 Bai Shan Lin’s yard in Linden: Locally-owned logging companies are demanding that they be granted similar concessions like foreign investors in light of revelations over a number of questionable allowances. local sector, the Forest Products Association (FPA) of Guyana has expressed concern about the damage that is being done to the image of the sector and has called for a level playing field for all operators. According to the body, whose members include a number of powerful locally-owned logging companies, these sentiments were expressed at a special executive meeting held on Thursday in the wake of the recent news about the foreign company and its operations. While FPA did not name the company, they were obviously referring to Chinese-owned Bai Shan Lin and Vaitarna Holdings Private Inc., an Indian company. ‘We welcome Foreign Direct Investment (FDI) in the forest sector but do not support the plundering of the forests. Rather, foreign timber companies should be more involved in downstream operations and value added production than in the exportation of logs,’ said Khallawan, President of the FPA. While the Association said it is aware that some of its members and other operators have benefitted immensely from selling logs, the trade in logs adds no value to the sector. An Association member from Berbice, according to FPA, noted during the meeting that there must be a level playing field in which local forest producers are given similar concessions as foreign companies. “The foreign companies are allowed duty free importation of large quantities of machinery and equipment while most local companies get no such benefit. How can a foreign company be given duty free concession and all it does is export logs while local sawmills that add some amount of value to the raw material are not given concessions?” the member asked. Another member pointed out that some of the foreign companies do elaborate business plans, outlining massive projects to use Guyana woods for furniture, building components and other things. One of the high end vehicles which Bai Shan Lin was granted duty free concession. The FPA also called for an even application of the regulations, procedures, and concessions to all operators, both local and foreign. As an example, FPA pointed to guidelines for the issuance of State Forest Exploratory Permits, for Timber Sales Agreements (TSAs) and for the acquisition of Log Export Licences. In following the guidelines of the codes and the scientifically calculated Annual Allowable Cut, the forests will remain sustainable for centuries to come. The FPA statement comes amidst intense interest in logging activities, the arrangements between Government and foreign companies operating in the sector and revelations of large concessions, duty free included, that have been doled out. 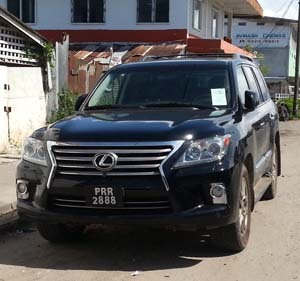 Among the vehicles granted under duty free concessions are a Lexus and Infiniti SUV. On Monday last, GFC defended the sector saying that logging activities are way below the targets set. The body also said that some foreign companies find it better to export than open local processing facilities, because of cost, an explanation that is not going down well.